You've had enough of being overweight and not feeling your best -- you want change now. Chances are, though, that you didn't gain the weight in just a few short weeks, so it's unrealistic to think you can take it off in that short of time. A healthy, sustainable rate of weight loss is, at most, 2 pounds per week, according to the Centers for Disease Control and Prevention. You may experience quicker weight loss in the first few weeks of dieting if you make drastic changes to your eating and exercise habits, but the weight loss rate will slow down as you get closer to your goal weight. By losing an average of 2 pounds per week, you'll lose 45 pounds in about 5 1/2 months. "Safe," in terms of weight loss, really refers to the method you use to lose it. If you lose 3 pounds per week with a juice fast, it's not an advisable strategy. But, if you lose more than 2 pounds per week with a nutrient-rich, calorie-sufficient menu plan and quality exercise, then it's probably okay. The problem is that to sustain a high rate of weight loss you have to work extremely hard and stick to a quite restrictive meal plan for many weeks. Losing just 2 pounds per week requires you to burn 1,000 more calories than you consume every day for the whole week. For most people, trimming 1,000 or more calories without adding exercise puts them at fewer than 1,200 calories daily, which could create nutritional deficiencies. Quick weight loss with very-low-calorie diets of 800 to 1,000 calories may be medically prescribed for morbidly obese people, but these diets come with risky side effects such as gallstones. Never cut your calories this low unless a doctor has ordered it and is monitoring your health closely. Weight lost quickly tends to be regained more easily. Exceeding an average of 2 pounds per week may also result in a greater proportion of muscle loss. Fast weight loss also happens when you're heavier. A loss of 45 pounds is dramatic, but not huge when compared to people who need to lose hundreds of pounds. 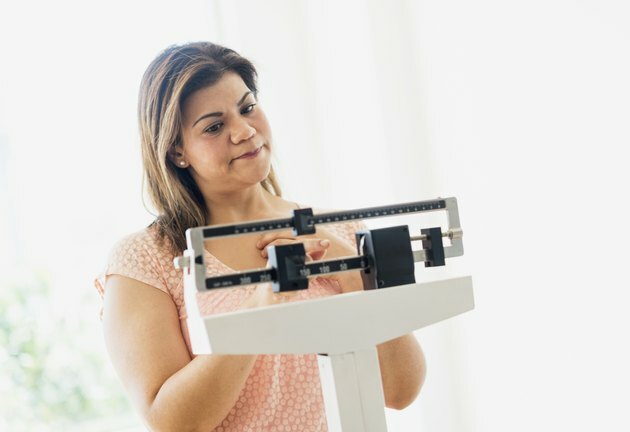 Those who have massive weight to lose may lose 45 pounds relatively rapidly compared to someone who's losing 45 pounds to achieve a 130-pound body size. Use an online calculator or consult with your doctor or a dietitian to estimate how many calories you burn per day to maintain your weight. If you can safely trim 500 to 1,000 calories from your daily calorie intake, make the calories you do eat of the highest quality. Skip processed foods altogether, along with empty-calorie foods such as sugary sweets, soft drinks and alcohol. Meals should consist of modest portions of lean proteins, leafy greens, low-fat dairy and whole grains. For example, your three meals might be scrambled eggs, bell pepper and mushrooms at breakfast; salad with roasted, skinless chicken, 1/4 of an avocado and mixed raw vegetables at lunch; and grilled flank steak, a small sweet potato and steamed broccoli for dinner. If you're hungry between meals, avoid energy bars and other high-calorie options like granola and trail mix. Go for cut-up vegetables, a 1-ounce serving of raw nuts or seeds, a piece of fresh fruit or a cup of low-fat, plain yogurt. The amount you eat at each sitting really depends on how many calories you can eat daily and still reach your goal. To lose a significant amount of weight, like 45 pounds, you'll need to commit to at least 250 minutes of exercise per week, notes the American College of Sports Medicine. This is almost 60 minutes, five days per week. If you exercise more, it will likely result in a faster loss, so you can reach your 45-pound goal more quickly. You still need to stick to a low-calorie diet, but be aware that dropping your calories too low could leave you without enough energy to exercise. Metabolic resistance training, which involves lifting weights in a circuit-style workout, and interval training, which involves alternating bouts of very-high-intensity cardio with lower-intensity bouts, are ways to punch up your fitness training with several workouts per week to get faster weight loss results. A paper published in the Journal of Obesity in 2011 explains that interval training is better than other types of exercise in reducing body fat while also increasing fitness levels. Resistance training has the ability to increase your resting metabolic rate, which will help you as you lose weight, and reduce body fat, explained a paper published in a 2012 issue of Current Sports Medicine Reports. If you hit a plateau, meaning your weight loss stalls, don't panic. As you reduce your body weight, your metabolism naturally drops because it has a smaller engine to fuel. Weight loss often becomes harder, and you may have to create a larger calorie deficit through diet and exercise to reach your goal. Try shaking up your workout to help recharge weight loss, too. Switch from running to cycling, reorder the strength exercises you perform, or increase the weight you use during strength training. If you do trip up along the way, remember that one bad day or week may set you back slightly, but you can still reach your goal. If you consistently cannot stick to the diet and exercise plan you've created, consider remodeling your goals so they're easier to achieve. Even reducing just 5 to 10 percent of your body weight can have positive impact on markers of health such as high blood pressure and high cholesterol.